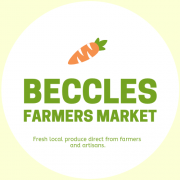 Beccles Food Assembly – New Online Market! Chloe and Margarett promoting the launch outside the market hangar. We’re excited to be launching an online market that will be allow you to order your produce to collect or have it delivered to your door. The online market will be open from the March 25-30th with the first collection held on April 1 from 10:30 – 12:30 alongside the normal market. We are breaking the mould as despite there already being 80 food assemblies in the UK we are the first traditional style of market to be integrating this model and only the second to open in the East of England. The Beccles Food Assembly is hoping to appeal to a new audience that the current market does not. With 50% of people currently doing some of their grocery shopping online and 20% of 25 – 34 year olds doing it exclusively online the market is adapting to keep up with demand and the convenience culture that customers have become so accustomed to. There will be a delivery option available although prices are yet to be confirmed. Membership is free and the assembly is urging people to share with their local friends and get in touch if interested in supplying or volunteering. To sign up and find out more visit our food assembly page.